(8/21/09) Champion Dragon Winery is located in a modern industrial looking building and produces 6000 tons, with most of it being sold off in bulk. They produce 10,000 bottles on their own, uniquely specializing in chardonnay and the unusual malvasia we tried the evening before. Pricing ranges from 80 to 200 RMB. They were harvesting the chardonnay when we arrived, and we noticed that they pick rather early – at 22 brix. Some of the grapes appeared to be slightly unripe, and we didn’t see any sorting. However, the chardonnay we tasted out of tank (after only 1 day of fermentation) was fresh, crisp with sharp apple and some citrus. It was simple and uncomplicated with no ML at this point; no oak; and no lees stirring. All of it was to be shipped in large tankers to wineries in other parts of China where it would be mixed into different brands, with perhaps some oak aging. They employ 20 full-time employees and 100 at harvest. A unique feature of this winery were its floors made of marble in the tank rooms. Marble is another of the major products of the region (along with oil, coal, jade and gold mining), and it is used extensively in hotels and other facilities. It was beautiful, but as we were exiting, one of the Chinese officials slipped and almost took a nasty fall because the red marble floor was wet from winemaking cleaning procedures. (8/21/09) The next morning we met at 9am in the lobby and then drove to the restaurant – scene of the banquet from the night before. Breakfast is more challenging for me to eat in China than other meals, because they eat a lot of vegetables and a milky rice porridge that reminded me of cream of wheat. Fortunately they also served hard boiled eggs, doughy white buns, and fresh melon and grapes which I ended up eating all 8 days for breakfast. They also serve green tea mixed with salty soy milk, which is a little difficult to get used to. Kindly, Demei brought packets of powdered coffee which I blended with warm milk. The Heshuo portion of the conference (we were to travel to Turpan for the next part) started at 10am with Chinese officials and research professors providing an overview of the local wine industry. This was all translated from Chinese to English for us by Demei – a winemaker and researcher himself. We learned that Xinjiang is the 2nd largest grape producing region (80% table; 20% wine) after Shandong near Shanghai. Heshuo and a large vineyard called Suntime produce the most wine grapes, with the Heshuo region currently producing 3,000 hectares and plans to increase to 7,000. 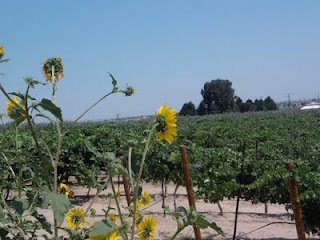 The region is high desert with sandy rocky soil – perfect for wine grapes. 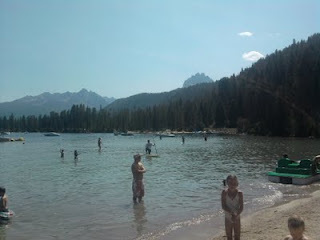 It is in a valley (3000 feet) surrounded by tall mountains (over 19,000 feet in some locations) and is close to a large body of water (Lake Bosten). Summers are quite hot at 40 C degrees (high 90’sF), but winters are freezing – dropping below -25C. This issue requires that they bury all grape vines during the winter – an incredible amount of labor as there are currently no machines invented that can handle this type of operation. However, since the going rate is 60 RMB ($10 US) per day for labor, the cost is not yet that high. As mentioned previously, because of the pristine protected climate, all grapes are organic – they even use natural fertilizer. The wines from here tasted much better than those I tasted in Beijing 2 years ago, and didn’t possess that acrid taint that seemed to reflect the pollution in the skies of Beijing – though to their credit, I saw less pollution in Beijing this time. Furthermore, I learned that much of the wine produced in Xinjiang is shipped in bulk to supplement the wine made by the 4 large producers in the Beijing and Shandong areas: Cofco (owner of Great Wall brand), Changyu, Dragon Seal, and Dynasty. Currently in Heshuo there are only 4 wineries, but the local growers want to increase this number so they can produce more fine wine, rather than just be a bulk wine producer. At the break, we tasted the wines of Aromatic Garden, Champion Dragon (as mentioned previously), and an all organic winery called Refine. 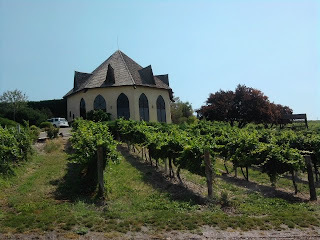 Unfortunately 3 of the 4 Refine wines – three 2005 Cabernets with varying oak applications and a 2005 Riesling – were oxidized, most likely because they didn’t use SO2 according to organic winemaking standards. The one that wasn’t oxidized – an unoaked cab – had a nice red fruit nose, was medium bodied with an elegant mouth feel, but ended with a bitter finish. We never did find out the name of the 4th winery. During the break, they paired the wines with table grapes and different varieties of Chinese cookies. I found that, amazingly, their soft easy-drinking cabs went quite well with mooncakes! They only plant 4 different varietals in Heshuo: 60% cabernet sauvignon, chardonnay, merlot, and Riesling. The Chinese still produce 90% red grapes, because they believe red wine is more healthy than white. Personally, I think that many Chinese do not like the taste of wine, and only drink it because it is fashionable and because the government encourages it. Besides, since they gulp it in toasts, they really don’t taste it. When they asked us for ideas on new grape varietals to plant, I suggested that they not only research what will grow well in their climate, but conduct some market research on Chinese taste preferences (as the Australians have done in China) to determine what will sell in their market. It is highly probable that white, rose, and sweeter wines will eventually sell better, as beginning with more tannic red wines is often difficult for the novice wine drinker. 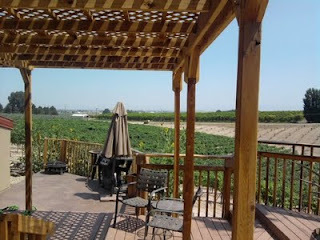 In the afternoon, we had a field tour and visited several vineyards and a winery. Spacing is 3.2 meters by 60mm (approx. 12 x 3 feet). The reason the middle aisles are so large is to allow them to lay the vines down and bury them in the winter. They use an unusual training system of single cordon which is tied vertically to the wire and pruned to 2 buds per spur. This is the same method they use for table grapes, and according to the viticulture professors with us, is probably not the most efficient. All vines are irrigated using water from Lake Bosten or snow run-off in the mountains. No rootstock is used, as the vines are all on their own roots. In most parts of the world this is unheard of due to disease risks – but here, in this remote valley, they are still safe with this practice. Hopefully it will stay this way. (8/20/09) If I was asked to name the best thing about the trip to the Xinjiang Region of China, I would have to say it was the hospitality. Everyone we met was incredibly charming, friendly, and helpful. They went out of their way to treat us well and serve us fabulous meals. In terms of wine, we started with a Malvasia from Champion Dragon Winery (Guanlong, in Chinese). It was floral with strong minerality, and unfortunately was served too warm – as is common in China with all wines. Next were the 2006 Cabernet and 2006 Reserve Merlot from Aromatic Gardens. Both were quite good with a ripe berry nose, medium-bodied and soft tannins, but the merlot actually had better concentration and some spice. Neither wine showed any complexity and both had medium-length finishes. As it was to turn out, the Merlot ended up being the best wine of the trip. Unfortunately, I was told that it is only available locally. As is traditional, they served the wine in very small glasses and provided about a one-ounce pour so that we could “gambay” (toast) with it. This required you to drink the complete glass, upon which it was promptly refilled. I was familiar with the custom from my last visit to China and knew as a woman it was expected that I participate in the first “bottoms up,” but afterwards could sip. Demei, our English speaking guide on this portion of the trip, kept cautioning and reminding me of this – which I appreciated. However, the whole custom is rather upsetting to me personally, because wine is not tasted for pleasure, but is knocked back as a shot. On the plus side, the Chinese government is encouraging people to drink wine (12-13% alcohol) over the obnoxious distilled rice spirit (40-60% proof) to cut down on riotous drinking and death from alcohol poisoning, as well as to save rice for food. As we proceeded through the evening with approximately 10 toasts, the men became more and more inebriated. This was accelerated when a troop of dancing women brought full goblets of wine to us on 2 occasions. The goblets were made of jade, gold, and silver – rather like the chalices at church, but without the stem. After toasting, they placed silk scarves around our necks to welcome us to the region. Soon we were all invited to dance with the dancers, who wore wonderful Arabic, Mongolian and Chinese costumes. Their dances were amazing, and this was truly one of the highlights of my wine travels around the world. We finally stumbled back to our rooms around midnight and didn’t have any trouble sleeping. 2008 Fiore CrossKeys – a delightful rose of Cabernet Franc that was flying off the shelf. They sold several cases while we were there and were running out of stock. It had a lovely berry nose and creamy mouthfeel with raspberry and pomegranate on the palate. Though it ended with 1% RS, it was still quite refreshing. I could see why it was selling so well ($16.50). 2007 Cabernet Franc CrossKeys – this was a lovely spicy fruity cabernet franc – just how it should taste. Both Mike and I were delighted with it, and bought a bottle. Plum, spicy and earthy nose; medium bodied; plum and blackberry on palate; good acid. $21.